Patricia and Estrella Estrada recently attended World Youth Day in Panama where they saw Pope Francis. Patricia and her sisters said that there were countless temporary structures like these built for the Pope’s visit. I sat down with Patricia Estrada, a Peer Minister, and participant in the World Youth Day retreat to recall the experience. The first mass, presided over by the Bishop of Panama City, exemplified this theme. “They held the mass along the coast of a beach. There were multiple stages set up across miles, and miles of flat land. Every single soul in attendance seemed to understand the words of God, the readings, and responses given in Spanish, English, Korean, French, Portuguese,” Patricia said. 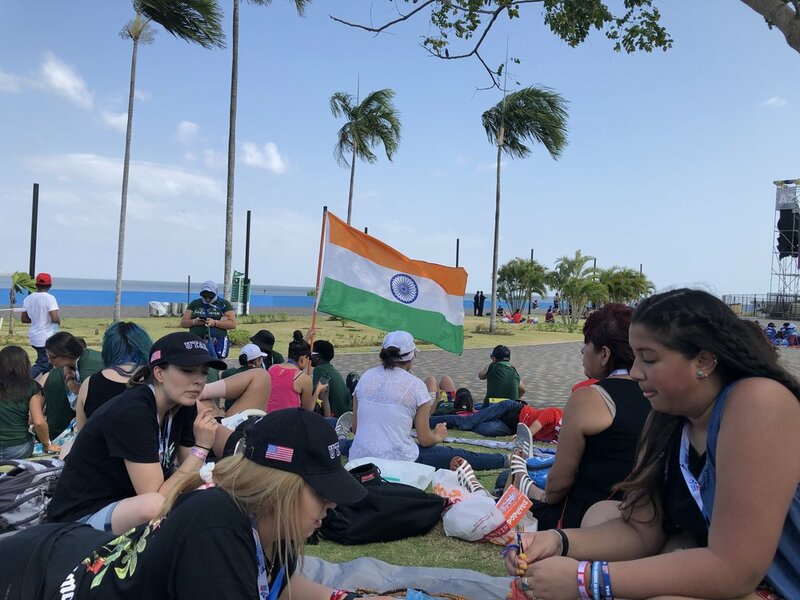 The priests in Panama, personifying this theme of faith in unity, celebrated every Mass, through the diverse, worldwide languages of the people participating in the event. The Masses culminated in the final liturgy, which was given by Pope Francis. Pope Francis is a man appointed by God, a pacesetter in faith, eloquence, and understanding. Pope Francis, who had explored the principles of a universal faith in various Vatican encyclicals, now expanded on those principles during his sermon, on the Estrada sisters’ last day in Panama. “It was technically the last day of World Youth Day. We had to go on this huge field. It was miles long with forty different sections. The space was for World Youth attendees to sleep, and wait for the last Mass that the Pope was going to give. They was camping outside with thousands of people around them. She continued: “It made you realize how different we are, and how we are the same. It was so human. There was still music going on, at four in the morning, there were people jumping around, and then at six they told us to get up because the Mass was going to begin. People that were a couple feet away from us literally jumped up, just started doing jumping jacks. They wanted wake up for the Pope’s mass.” In the end 700,000 people attended that mass. Patricia then talked about the theme of the event. Patricia’s story is a powerful depiction of our human capacity to connect with one another, through the sincere desire for faith in one another we extend a universal body of belief.